Y Venugopal Rao, it seems, can do no wrong as a batsman at present. He missed out on a well-deserved century yesterday when he lost his wicket trying to accelerate the scoring rate and was out on 98. Y Venugopal Rao (left) is congratulated by India B players after he completed his century which resulted in India Seniors’ victory in a league match of the Challenger Trophy at the PCA Stadium at Mohali on Tuesday. Yuvraj Singh (right) finished unbeaten on 99. Star allrounders Jacques Kallis and Andrew Flintoff were declared joint winners of the Player of the Year Award at the ICC Awards function here tonight. The duo polled 86 votes ahead of other nominees, Glenn McGrath (39), Adam Gilchrist (29) and Ricky Ponting (19), to bag the Sir Garfield Sobers Trophy. South Africa’s Jacques Kallis (left) and England’s Andrew Flintoff hold their trophies during a press conference at the International Cricket Council Awards in Sydney on Tuesday. 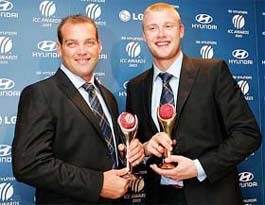 Kallis and Flintoff were named joint winners of the Sir Garfield Sobers Trophy for the ICC Player(s) of the Year. The International Cricket Council today indicated that cricket could be included as a discipline in the 2010 Commonwealth Games, to be hosted by New Delhi. The Board of Control for Cricket in India today termed as “baseless and totally untrue” reports in a section of the media that Rahul Dravid had been named the skipper for the upcoming one-day series at home against Sri Lanka. Viswanathan Anand overshadowed Rustam Kasimdzhanov of Uzbekistan to emerge clear third after the 11th round of the World Chess Championship here. The fourth victory by the Indian ace also helped him move within two points of championship leader Veselin Topalov of Bulgaria as the latter survived a scare before getting a draw against Michael Adams of England. Indian tennis sensation Sania Mirza breezed into the second round of the $ 200,000 Thailand Open WTA tournament here today after beating Slovakia’s Henrieta Nagyova 6-1, 4-6, 6-0. The Sports Authority of India Coaches Welfare Association (Punjab unit) has challenged the recent transfer of coaches ordered on a large scale by SAI in the Chandigarh Bench of the Central Administrative Tribunal. Fifth-seeded Patty Schnyder of Switzerland rallied to beat Russian teenager Anna Chakvetadze 2-6, 6-2, 7-5 in the first round of the Kremlin Cup tennis tournament. Earlier yesterday, Russia’s Elena Likhovtseva came back from a set down to defeat compatriot Vera Douchevina 3-6, 6-2, 7-5. The All-India Football Federation today announced here today that 13 referees, a match commissioner and a referees’ inspector would supervice the matches in the 27th Federation Cup Football Tournament, to be held at Jawaharlal Nehru Stadium, Fatorda, Goa, from October 19 to 30. The corporate world in Gurgaon and other parts of the National Capital Region is resorting to a high dose of golf to evolve a new socio-economic code. While corporate firms organise amateur golf competitions among their executives, others do it keeping only their employees and clients in the frame. Vidya Devi Jindal School, Hisar, defeated Government Maharani Laxmibai Girls School, Chattarpur, Madhya Pradesh, 3-1 to record their second victory in the 12th Nehru Girls Hockey Tournament at the Shivaji Stadium here today. Harbhajan Singh of India Seniors dismisses Sreekumar Nair of India B during a league match of the NKP Salve Challenger Trophy at the PCA Stadium in Mohali on Tuesday. As luck would have it, he could have easily missed out on a deserving three-figure mark today also as enough runs were not there on the board and Yuvraj was batting at the other end on 99. But as good luck would have it, Rao, when batting on 97, got an cheeky boundary, which enabled him to reach the three-figure mark. The boundary also sealed a seven-wicket victory for India Seniors over India B in a league match of the NKP Salve Challenger Trophy at the PCA Stadium here tonight. Local lad Yuvraj Singh deserves equal credit for the victory. Though he was left unbeaten on 99, he must have been pleased with his efforts, instrumental as these were along with Rao in clinching a convincing victory for his team. 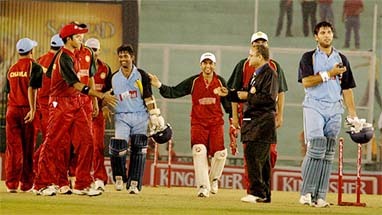 Rao and Yuvraj were involved in a record 209-run unbeaten stand, which paved the way for victory. The victory, however, was not without its share of twists and turns. Chasing a modest target of 241 runs, Indian Seniors were in a precarious situation at one stage when they were left tottering at 33 for three. Seamer Sreesanth, who bowled an inspired first spell, threatened to rock the Seniors boat with twin strikes. He first jolted the innings, claiming the key scalp of Sachin Tendulkar, who disappointed for the second day running and scored just four runs after facing 13 balls. Tendulkar was flummoxed by an in-coming delivery and was adjudged lbw. 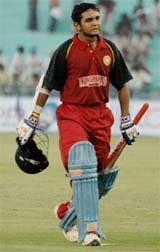 After Tendulkar’s dismissal, the 22-year-old Kerala seamer consumed skipper Mohammad Kaif when the batsman had yet to open his account. Sreesanth could have further pushed Seniors to the wall when he castled Rao off the very first ball the batsman faced, but it was ruled a no-ball. This was the sole blemish in the innings of Rao, who grew in confidence after that early lapse and went on to play an authoritative innings. Yuvraj was confidence personified throughout and looked determined to notch up a big score. He started with his trademark lofted strikes over the in-field in the square leg area for a couple of gorgeous fours. Soon thereafter, he settled down to play a mature innings. Rao gave a good account of himself and played his strokes on either side of the wicket. Agile with his footwork, he looked equally adept in finding the gaps between fielders. Compiling runs at ease he soon forged ahead of Yuvraj as the southpaw was the first to complete his half century. Rao’s unbeaten knock was studded with 15 fours, while Yuvraj hit 13 boundaries. Earlier, India B failed to put on a challenging total in the face of disciplined bowling by seamers. Irfan Pathan bowled a better line today, while Ajit Agarkar also maintained discipline to keep the India B scoring rate under check. Skipper Dinesh Mongia failed to use the occasion to notch up a big score. He miscued a pull stroke off Pathan and was out after scoring 34. Wicketkeeper Parthiv Patel batted well and scored a breezy half century, while S Sriram contributed 44. India A will now clash with India B in the last league match tomorrow. Fall of wickets: 1-37, 2-52, 3-124, 4-130, 5-188, 6-189, 7-198, 8-223, 9-228. Bowling: Irfan Pathan 9-0-39-3, Agarkar 10-1-44-2, Yadav 8.4-1-31-1, Harbhajan 10-1-48-2, Kartik 8-0-41-1, Tendulkar 2-0-15-0, Yuvraj 2-0-18-1. Fall of wickets: 1-25, 2-29, 3-33. Bowling: Bhandari 6-1-28-0, Sreesanth 10-1-63-2, Bose 7-0-39-0, Sunny 5-1-18-0, Yusuf Pathan 9-0-42-0, Nair 2-0-14-0, Mongia 3-0-15-0, Chawla 3.5-0-21-0. Star allrounders Jacques Kallis and Andrew Flintoff were declared joint winners of the Player of the Year Award at the ICC Awards function here tonight. The duo polled 86 votes ahead of other nominees, Glenn McGrath (39), Adam Gilchrist (29) and Ricky Ponting (19), to bag the Sir Garfield Sobers Trophy. The Test Player of the Year Award was won by Kallis. England’s Kevin Pietersen pipped hot favourite Flintoff to clinch the ODI Player of the Year Award. The big-hitting Pietersen polled almost twice as many votes his team-mate Flintoff, the winner of the inaugural award in 2004. Pietersen’s success continued a tremendous night for the 25-year-old, who was also named as Emerging Player of the Year. There were not many cheers for Indians at the function. Dinesh Kaarthick, the lone Indian nominee in the individual award category — Emerging Player of the Year — did not make the cut. Even in the two team awards, there were only three Indians who could find place in the ICC one-day and Test team sides. While Virender Sehwag and Anil Kumble (12th man) were picked in the Test Team of the Year, Rahul Dravid found a place in the ODI Team of the Year. No Indian player managed to break into both the teams. The International Cricket Council (ICC) today indicated that cricket could be included as a discipline in the 2010 Commonwealth Games, to be hosted by New Delhi. The Executive Board of the ICC, which met here over two days, had asked the Board of Control for Cricket in India (BCCI) to meet the local Organising Committee for the 2010 Commonwealth Games in Delhi to discuss cricket’s participation in the event and the appropriate format. “The BCCI was asked to then come back to the board with its recommendations concerning cricket’s participation in the Games,” according to a press note. The Board of Control for Cricket in India (BCCI) today termed as “baseless and totally untrue” reports in a section of the media that Rahul Dravid had been named the skipper for the upcoming one-day series at home against Sri Lanka. Commenting on reports on a couple of TV channels that Dravid had been named as skipper, BCCI Secretary S K Nair said it was baffling how such a news could be flashed given that the selectors were to meet on Thursday to pick the captain. “How can anybody be selected even before the selection committee sits down to deliberate on it? The entire report is baseless,” Nair told PTI. He also rubbished suggestions that the Board had directed selectors to name Dravid ahead of Ganguly. “There has been no such directive from the Board,” he stated categorically. Cricket Board Joint Secretary Gautam Dasgupta also dismissed the reports as “completely baseless and totally untrue”. Indian cricket vice-captain Rahul Dravid’s wife Vijeta gave birth to a boy here this morning. Rahul’s father Sharad Dravid told mediapersons that his daughter-in-law delivered the baby boy at a private nursing home ‘’Danwantari’’ in Dharampeth locality of the city. Both the baby and the mother are in good health, he said. Sharad Dravid said he had informed Rahul, who is in Australia for the Super Series. Viswanathan Anand overshadowed Rustam Kasimdzhanov of Uzbekistan to emerge clear third after the 11th round of the World Chess Championship here. The fourth victory by the Indian ace also helped him move within two points of championship leader Veselin Topalov of Bulgaria as the latter survived a scare before getting a draw against Michael Adams of England. In the other decisive game of the day, Peter Svidler made his bid for the second place by defeating another contender, Alexander Morozevich of Russia, while Judit Polgar put an end to her losses by taking a draw with fellow Hungarian Peter Leko. With just three rounds remaining in the event, Topalov inched closer to the title and moved to 8.5 points out of a possible 11. The lead gap was narrowed a bit by Svidler, who took his tally to seven points, and Anand, at this stage, was on 6.5 points. Morozevich fell behind after an insipid loss against Svidler, but still maintained the sole fourth spot on 5.5 points. Peter Leko was next in line on five points, half point ahead of Kasimdzhanov, while Adams was placed seventh on four points. Kasimdzhanov had beaten Anand in their previous meeting in the championship and certainly the Indian ace wanted to settle scores. Playing the white side of an English attack, Anand, an exponent of the variation, came up with a surprise knight manoeuvre, that rattled Kasimdzhanov right from the early stages of the middle game. Seeded fifth, the 18-year-old Indian allowed her unseeded rival to stretch her into the third set after losing concentration in the second. Sania, ranked 31 in the world, had made it to the semifinals of the Japan Open last week where she lost to third seeded Tatiana Golovin of France 2-6, 4-6. Moscow: Fifth-seeded Patty Schnyder of Switzerland rallied to beat Russian teenager Anna Chakvetadze 2-6, 6-2, 7-5 in the first round of the Kremlin Cup tennis tournament. Earlier yesterday, Russia’s Elena Likhovtseva came back from a set down to defeat compatriot Vera Douchevina 3-6, 6-2, 7-5. Chakvetadze (18) opened with a break and had one more in the seventh game to take the lead in the match, but Schnyder, ranked 10th in the world, came back to level at one set all. Schnyder had a break in the sixth and eighth games of the third set, but the Russian fought back both times to move even at 5-5. The Sports Authority of India (SAI) Coaches Welfare Association (Punjab unit) has challenged the recent transfer of coaches ordered on a large scale by SAI in the Chandigarh Bench of the Central Administrative Tribunal (CAT). A notice of motion has been issued to the Union of India, through the Secretary, Government of India, the Director-General, SAI, Secretary, SAI, and the Regional Director, Northern Centre, SAI, Sonepat, for December 1. The association, in its petition which has mentioned Mr R.P. Wattal and Mr B.K Sinha, Director-General and Secretary of SAI, respectively, as respondents, has said that 91 members of the association have been transferred of a total of 100 which has resulted in the dislocation of 736 coaches all over India. Fifth-seeded Patty Schnyder of Switzerland rallied to beat Russian teenager Anna Chakvetadze 2-6, 6-2, 7-5 in the first round of the Kremlin Cup tennis tournament. Chakvetadze (18) opened with a break and had one more in the seventh game to take the lead in the match, but Schnyder, ranked 10th in the world, came back to level at one set all. Schnyder had a break in the sixth and eighth games of the third set, but the Russian fought back both times to move even at 5-5. Schnyder sealed the win on the second match point in the 12th game. VIENNA: Briton Tim Henman secured only his second victory since Wimbledon when he beat French qualifier Antony Dupuis 7-5, 6-3 to reach the second round of the Vienna Trophy tournament on Monday. Henman had won each of their three previous meetings, but had just two victories in his last five tournaments, and had missed recent events in Bangkok and Tokyo due to a back injury. The All-India Football Federation (AIFF) today announced here today that 13 referees, a match commissioner and a referees’ inspector would supervice the matches in the 27th Federation Cup Football Tournament, to be held at Jawaharlal Nehru Stadium, Fatorda, Goa, from October 19 to 30. Referees: Rizwan-ul-Haq and Abdul Saleem (Delhi), Gokulananda Sharma (Manipur), Walter Pereira (West), Benjamin Silva (Goa), S. Suresh, T. Pradeep Kumar, K. Sankar (all Tamil Nadu), Syed Shujauddin (Jharkhand), Shaji Kurian (Kerala), Subrata Sarkar (Bengal), Chamchuk Lama (Sikkim) and A. Arjunan (Services). Delhi Soccer Association Vice-President B.S. Chauhan was appointed match commissioner while Michael Andrews (Kerala) would be the referees’ inspector. The corporate world in Gurgaon and other parts of the National Capital Region is resorting to a high dose of golf to evolve a new socio-economic code. While corporate firms organise amateur golf competitions among their executives, others do it keeping only their employees and clients in the frame. The ICICI Bank recently launched the ICICI Bank Private Banking Masters 2005 here. Functionaries of the bank claimed that it was the largest domestic invitation amateur golf event conducted in India. Thirtytwo corporates battled it out here for the Teacher’s Achievers Office Golf Championship on a small makeshift golf course on the terrace of a hotel here recently. The idea was to allow space and occasion for the stressed corporate top brass to relax. Nandita Dhingra, Ritika Chaudhary and Simran Saharan scored the goals for the Hisar school. Niharika Saxena reduced the margin for the Chattarpur school. Haryana clinched the Rahimutulla Cup for men by beating Chandigarh in the final of the North Zone Badminton Championship, organised in Udaipur from October 1 to 3. In the first singles, Piyush outclassed Mandeep 17-14, 10-1. In the second singles, Sumit Dahiya thrashed Vivek in straight sets 15-7, 15-9. In the doubles, Sachin and Saurav defeated Vivek and Gurjeet 15-10, 15-11. Sixtyseven-year-old industrialist Vijayapat Singhania plans to fly in a behemoth balloon on November 19 in a bid to scale a height of over 70,000 feet to beat the existing world record of 64.997 feet, set by Per Lindstrand of Sweden in 1988. Title favourites and former champions Simla Youngs scored a facile 4-0 victory against New Delhi Heroes in a Super League match of the SAIL-ONGC Delhi Soccer Association Senior Division Football League at the Ambedkar Stadium here today. The goals came two each in either half. Nigerian Ogbedeie Aminawon Austin, Pradeep Nandi, Rakesh Palmei and Dharmender Kharoila were the scorers. Delhi rallied to defeat Punjab 2-1 in their last preliminary league match to top Group II in the Sub-Junior North Zone National (Under-16) Football Championship for the Mir Iqbal Hussain Trophy at Srinagar today, according to the information available.